I took the day off from running yesterday to go into deepest darkest Brooklyn in order to sign my new lease. 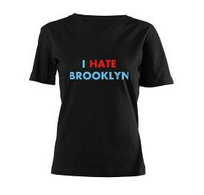 I may - or may not - have followed that up by ordering a t-shirt that says "I hate Brooklyn" from cafepress after drinking the vast majority of a bottle of moscato. Come August, my usual West Side Highway route will be replaced by loops of Prospect Park. My typical jaded New Yorker routine will be replaced by an even more jaded hipster schtick. Irony is dead; long live irony! I already registered for a 10m race in Prospect Park in August. Shall I now sign up for the Brooklyn Marathon? Btw, thank you for all of the thoughts and suggestions after my run on Monday. I did an easy 5m on Tuesday as hair of the dog, and I felt much better. I've taken it easy the past few days, making sure to drink a lot of water. So far, so good - let's hope that doesn't happen again. Brooklyn can only get cooler with you living there. I think you are going to love Prospect Park. And just think, when you run the NYC marathon, you'll spend 13 miles in your 'hood! You are too nice... I love it! Brooklyn getting cooler? Hahaha, it's as cold as ice already. Maybe you'll skip the hipster thing and just become a Park Slope organic / gluten free / helicopter / I bring my baby to bars mom instead. Or not. In the meantime, while you still live within 10 miles of me we should meet up! No. I mean, unless someone wants to loan me a baby. And then, sure, I'll bring it with me to bars. But YES, let's please meet up! !